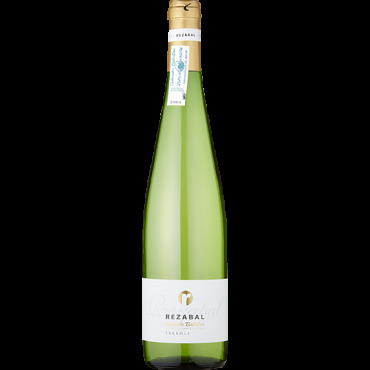 Sparkling Bodegas Rezabal Txakoli White 2018 - Royal Wine Merchants - Happy to Offer! Zesty, refreshing, effervescent! Bodega Rezabal was established in 1996 by the Rezabal family and is from the Getariako Txakolina region near the Pyrenees in the Basque. Made with the local grape, Hondarrabi Zuri (white), it is often poured from a height to aerate the wine and increase the amount of bubbles in the glass, it is aromatic and zesty, with flavours of green apples and citrus fruits. A perfect palate cleanser and ideal with a plate of tapas and fried snacks!